I finished the finale of Breaking Bad tonight. Fantastic show. The logical and methodical progress from one minor evil to another minor evil eventually evolving to heinous acts was beautiful. The desire to be "someone" instead of another nameless face also speaks to me. Behind the scenes trivia: The "meth" they used in the show was actually cotton-candy flavored rock candy. In every morbid scene of death, violence, and horror the actors were working in an environment that reeked of cotton candy. Personal note: The little boy living in the crackhouse with the meth head mom ... was me. I came from that before I was adopted. I am immeasurably fortunate. I just finished number four in the Jack Reacher series. <spoiler>The author overstates the power of Hypnotism</spoiler>, but it's still a good read. If you're into action fiction, this series is worth reading. Big B passed his hunter safety course today. He can go hunting now! I'm very pleased for him. On the same day we put a new tire on his bicycle, moved all the leftover deck wood to the shed, re-tensioned the garage door torsion spring, moved the old dead lawnmower off the driveway, watered the plants, winterized the pool, did a week's laundry, packed, and headed back out. My weekends grow shorter as a function of time. This book tells the story of the great Boston Molasses flood. The book can be roughly divided into thirds. One third covers the actual Molasses flood. The second covers the Civil Trial related to the event. I liked learning the story of the people, the tank, the flood, and the trial. The final third (laboriously) covers the political climate and history around the time of the events. This part seemed to drag on, but really was necessary to give context of the history. 1915 was a vastly different time. Today's NIMBY groups would literally combust at the idea of constructing something like this in a busy commercial district of the Boston waterfront. Today I fixed Little B’s Nook Color. Last week she came to me sobbing. She’d dropped her nook from her bed and it landed screen-first into a chair. 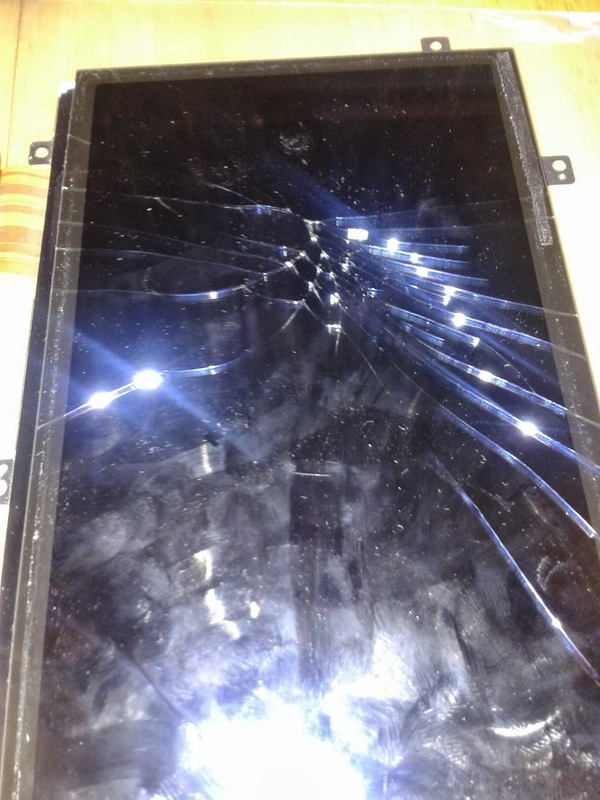 The LCD was shattered. 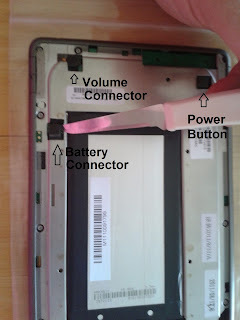 I followed this YouTube video to disassemble the nook. 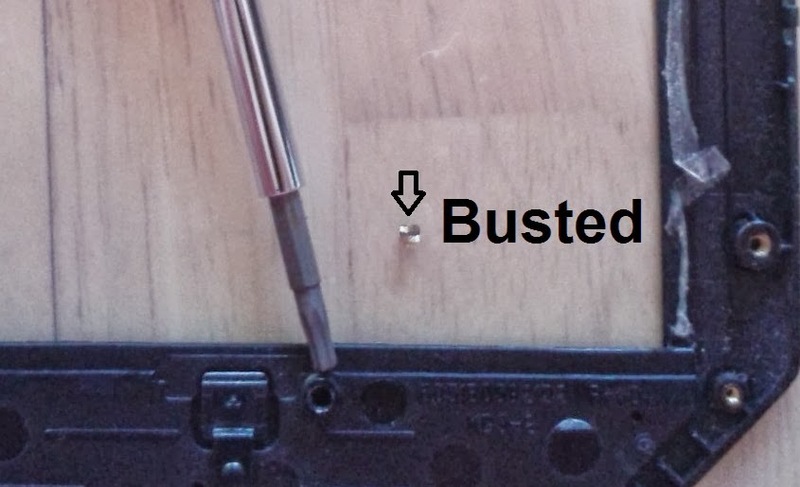 Warning: This video is WRONG about one part of the disassembly. 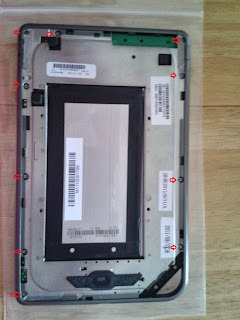 Removing the front bezel before removing the LCD and PCB damages it. There is a small brass bushing molded into the bezel that is ripped out of the plastic by doing it this way. If you reuse the same bezel you won’t notice this, but installing a new bezel will cause an ugly hump in the plastic next to the “n” button. 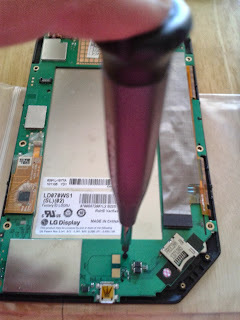 Instead you have to pull the Bezel/LCD as an assembly to get to the screw holding this bit on. Remove the MicroSD card, if equipped. Remove the screws. They are a Torx T-5. As an aside, I bought this screwdriver from Home Depot for $5 for this project. It has T4-T10 and T-15. It’s not magnetized by the manufacturer, so I rubbed it across a magnet to make this job easier. Chasing dropped screws _sucks_. 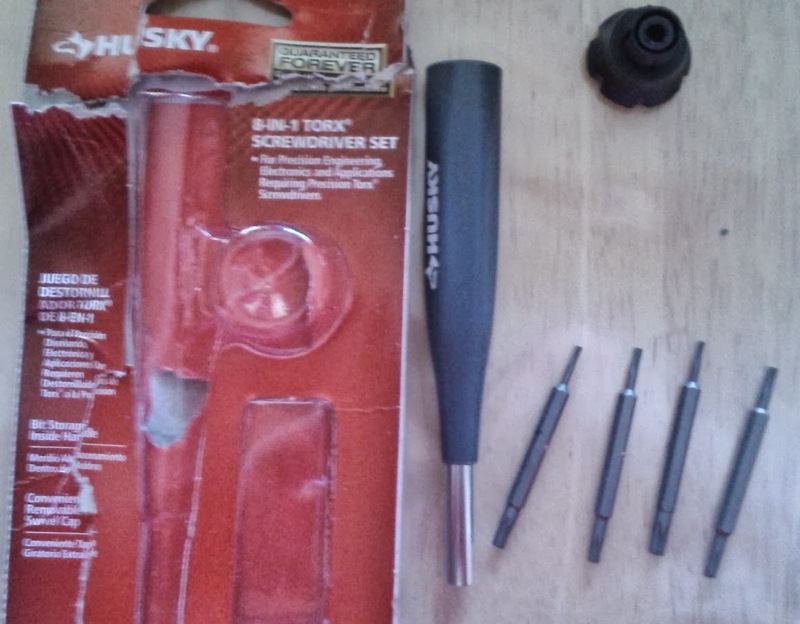 I also bought some other new tools, but that’s a post for another day. 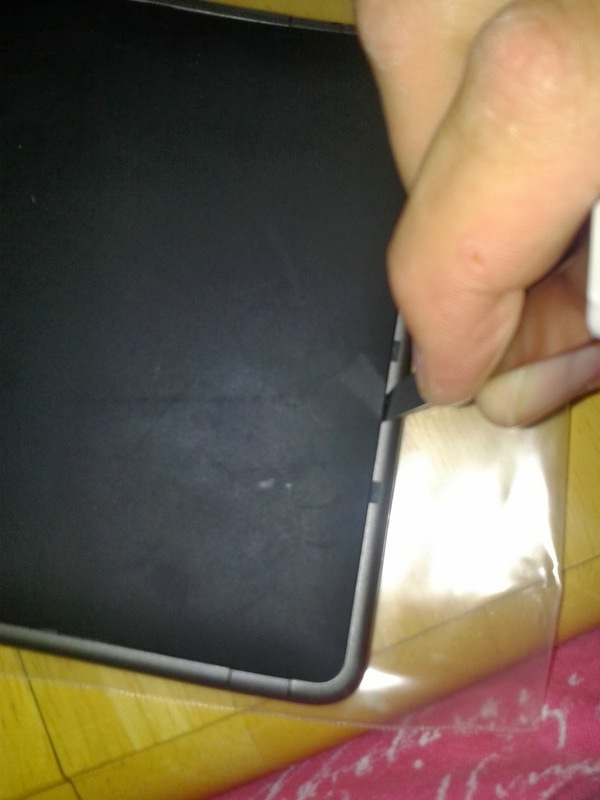 Using a thin flat blade, gingerly pry the locking tabs out to remove the back cover. This is easier if you start in the middle of a long edge. I didn't know that when this was taken. Remove all of the visible screws, and the ones hidden under the tape in the corners. At this point, my instructions diverge from the youtube video. Using your thin flat blade pry the battery, volume control, and power button cable connectors straight up. Try not to knock the soft foam blocks off of them, as they help keep the cable from vibrating loose. Push on the PCB/LCD/Bezel assembly from the corner where the microSD card goes. Simultaneously, use your flat tool to pry the front bezel latches away, loosening the PCB/LCD/Bezel assembly from the aluminum nook body. 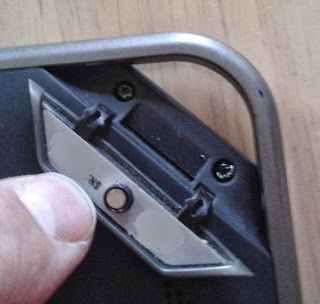 Remove this screw to free the bezel. It is now held on only by the sticky tape. The PCB/LCD disassembly matches the process in the video. 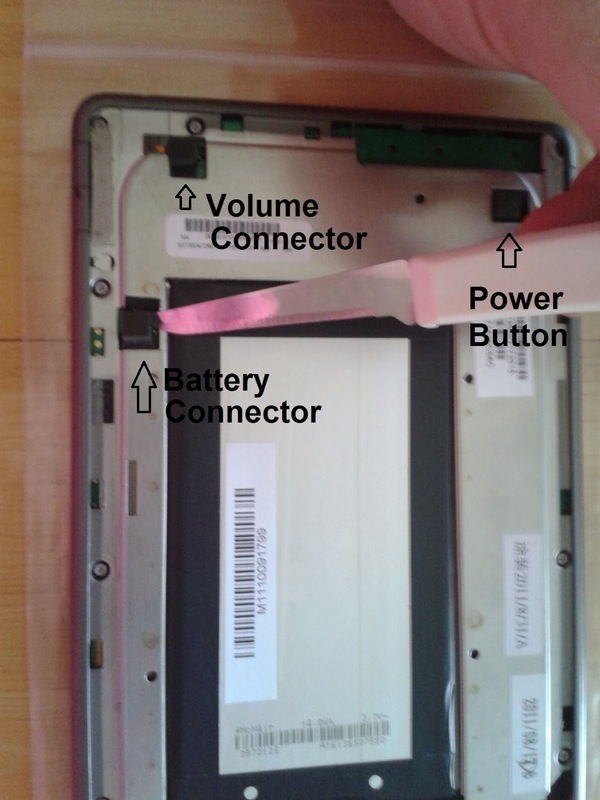 Reassembly tips: When replacing the back cover of the nook put the microSD slot cover corner together first. It won't snap in properly if you leave it for last. Also double check to make sure the power and volume buttons are lined up neatly before you screw it all back together. I got my parts from this ebay auction “Nook Color Display and Digitizer Assembly” by the seller wallachee. 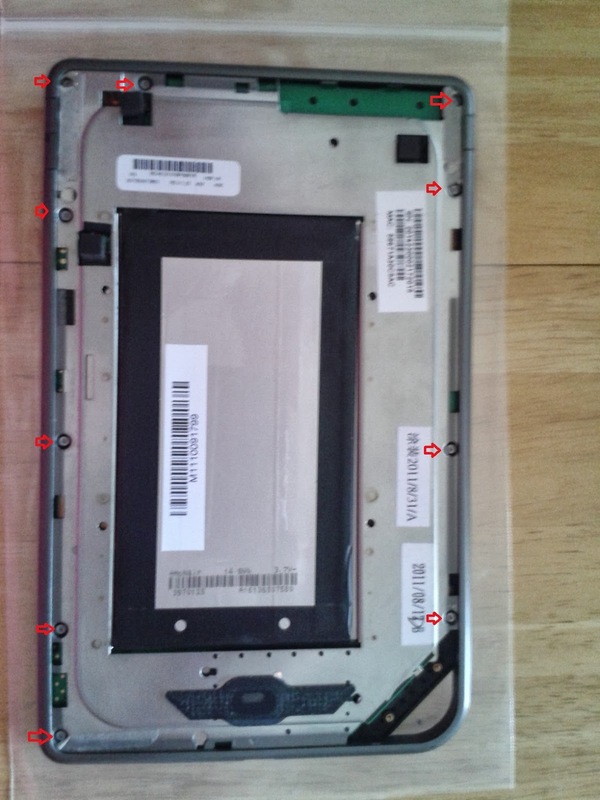 It is the complete LCD/Digitizer assembly with the bezel. The auction describes it as used, but the one I got was flawless. I would have guessed it was NOS if I didn't know better. Post-nook-fixing we had dinner at the Bell Buckle Café and I played Modern Warfare on the xBox with Big B. He gets hilariously annoyed when I kill him in the game. Muahaha. So about that insomnia.. I read the next book in the series: Ashen Winter. Just finished Ashfall, a book about trying to survive in a post-yellowstone caldera apocalypse. I liked it. There is a sequel called Ashen Winter. Amazon here I come. Maintenance window was uneventful. 302 non-production servers restarted. Chinese food for dinner at China Wall. I love their green tea ice cream. I noticed a new building going up as I was leaving work. They are building a Jimmy Johns within fair weather walking distance of the office. I am ecstatic. Last night was a movie night. I went to see Riddick and Elysium. I enjoyed Riddick. There was a great line in it about Bad days and extraordinarily bad days. You get to "see" a lot more of this planet, not like pitch black. Visually loved the movie. The monsters were realistic, otherworldly, fantastic. Elysium is also visually beautiful, and I enjoyed the action sequences. That's the good part. The bad part is about 10 minutes in when you get that whole movie is a bad metaphor for the immigration situation here in the United States. The non-citizens scrimp and save for a chance at a coyote ride to get to the space station equivalent of the Hamptons. The comparison really falls apart if you put some mental effort into it, and that broke the movie for me. Also, short of fairy dust or nuclear fusion you aren't going to shoulder-fire a missile capable of intercepting a target on an orbital trajectory. Not. Gonna. Happen. There is a maintenance window tonight at work and I'm going to work on the kid's Minecraft server too. I mowed the whole yard and helped Big B with the Weed-eater. Took Little B to the Ascent, an indoor rock climbing place. Played on the Xbx with Big B. Had a maintenance window for work. We're doing a Windows 2003 to Windows 2008 AD migration that is pretty cool. This weekend we hid the old windows 2003 DCs from DNS. Hypothetically all of the workstation and server traffic should migrate over to the new 2k8 DCs, leaving only any hardcoded stuff behind. Those we can identify with wireshark and remediate. 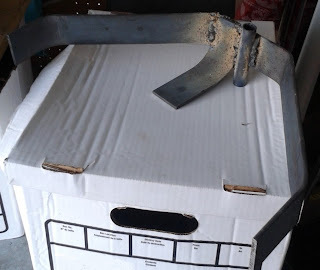 I finished designing the hitch for the mower. It's not compeletely done though. I couldn't find the (expletive) chuck key for the drill press. I'm going to get a replacement from Northern Tool this week. 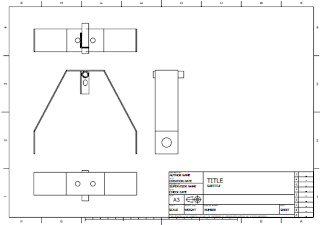 I also had to change the design of the support bracket from the drawing. I broke my vice bending the 3/16 steel and there was no way I'd be able to put a 90 bend across the long edge without completely destroying it. Big B helped me weld it. He did a good job for his first time out. 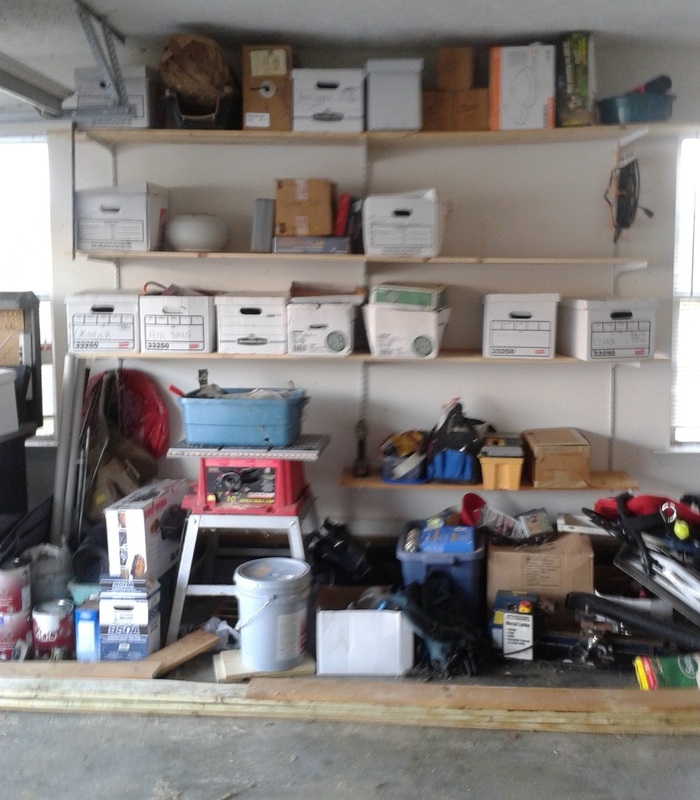 I also worked on the shelving in the garage. I replaced the 12 inch shelves with 18 inch ones. This lets a file box sit up there properly without falling off at every sideward glance. Brenden and I tried a thermite reaction. It was pretty cool, but I got the proportions of reagents wrong. One of my upcoming science projects involves getting useful work out of this type of reaction, so it was a good first time project. I also I'd really like to do some science, but I have to get my garage clean. It's bugging me. This week I'm building a new Minecraft server and carving some foam. Fun. 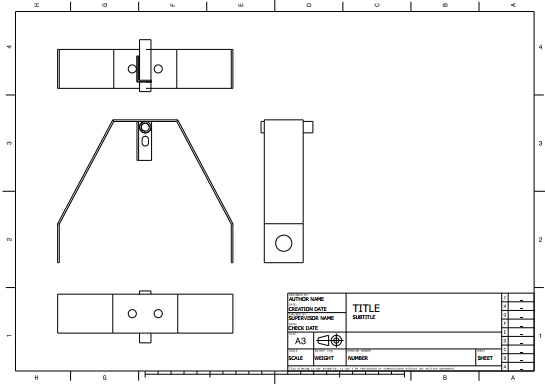 Today I spent a bunch of time working on CAD/CAM. I tried MakerCam, played with Mach3, and did more FreeCad tutorials. A couple of random dogs came by the house. I gave them water and offered cat food. No takers on the latter. I fished the lost screw out of the pool tool It is swimmable now and will be clear in a few days. We sold Little B's toddler bed and I watered the plants too. The rosemary and Philodendron cuttings I started are really taking off. 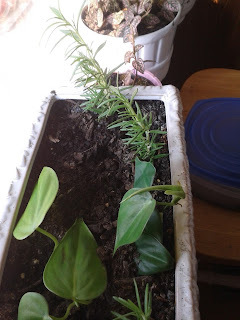 If you like plants, learn to take cuttings. It is really exciting to see them take off. I've been successful with Christmas Cactus too. My In-Laws live in a very rural area. Their address qualifies for cable modem service, but the cable company wanted an arm-and-a-leg to install a new pole and string cable to the house. They tried the HughesNet satellite, but were unhappy with the pitiful speed and latency. So... I talked to the neighbors and got permission to share their internet connection. Then I bought some wireless kit and today was get-it-working day. The distance between the houses is 300 yards+. That's a long way. I got a 14db Directional panel antenna, a R36 Wireless router from Data Alliance. I re-used my old Alfa High-power usb adapter. I used the vise to flatten out the mounting bracket that comes with the Antenna to mount it inside an attic window. Then the AP and Alfa mounted to Roof rafters. Viola! They have internet now! A speed test puts it at 1.2mbps up and 1.4mbps down. Fantastic! The R36 has a username/password from the manufacturer and it's not in the documentation in the box. It's admin/admin. I got lucky and guessed it. 1. Next time I should bring my drill. Screwing brackets in by hand is "fun". 2. Bring my box of random screws too. 3. I could have gotten a Yagi with higher gain for the same price. I should have gotten that instead. oops. I'm concerned about the heat in the attic cooking the AP. We'll see how it does. I promoted 12 domain controllers and fixed a DNS problem. Then we went and picked up a new (to us)(Craigslist) bedroom suite and couches. Then I took Mr. B's bed apart, moved our old bed in his room, moved his bed into Little B's room, took her bed apart and put it in the stuff-to-sell pile. This morning I lit the burn barrel and torched a bunch of scrap wood. Big B and I got the weed eater running and he did the lawn edge at the road. Then we went to our in-laws and I setup a new Wifi connection for them. That's the subject of my next post. I have 4 separate blogs, all of which I've neglected. This is the one blog to rule them all. I'll be compiling them all into here. I get bored very easily. My parents always told me to "Do Something" when I'm bored.